What the Shockwave is, is basically a legal to own, stockless, short-barreled, 12 Gauge firearm. It’s legally “Not a Shotgun” because of some reasons no one really gets but everyone, including the ATF, is playing along with. Because no one really cares about barrel length anymore. Too late for Randy Weaver’s family… but there we have it. 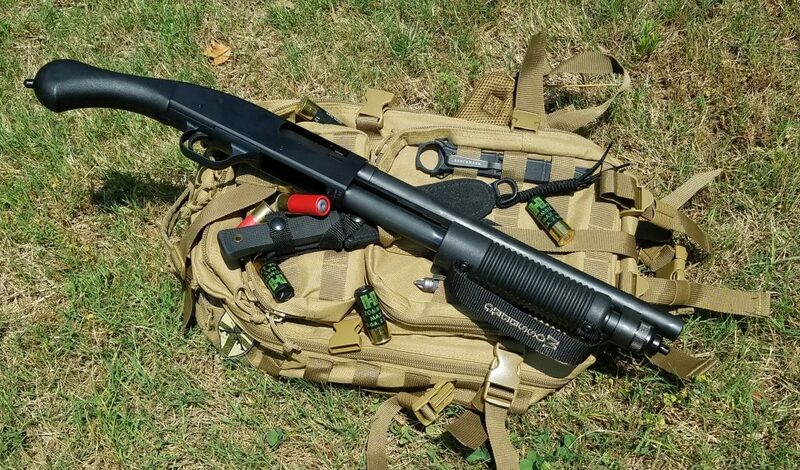 It’s based on the Mossberg 590 platform, which gives us a robust action and a heavier barrel, making this one tough little firearm. Now, this kind of gun isn’t new. Short shotguns have been really quite useful when a compact gun with massive firepower is needed. 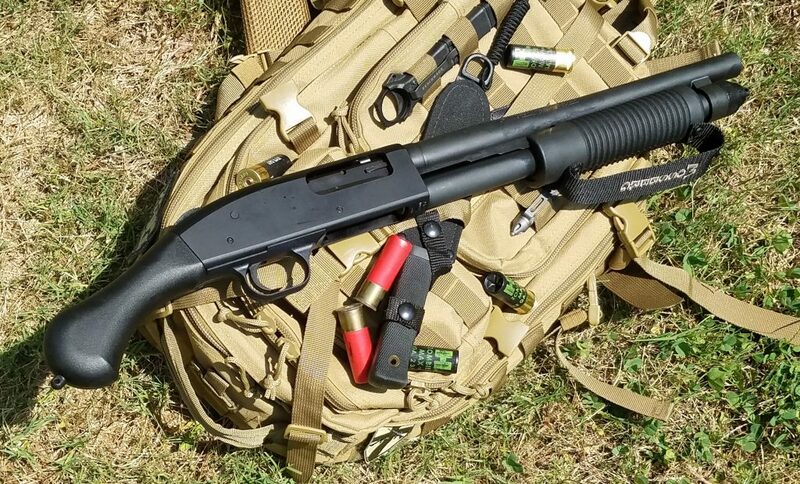 Famously, the US Marshalls have been using this time of gun for a long time… Their’s is based on the Remington 870, and you can pretty much buy one just like that. But personally, I’ve grown more fond of the Mossberg’s action. These guns offer devastating short-range “stop right now” authority. Now, I don’t know about you, but pretty much any angle around my 4,000 square foot house is still well within the realm of Close Quarters Battle. So anything with 800 Meter, Sub-MOA accuracy is probably not the best solution. Something that can be stashed in a smaller concealed and unexpected place… well, that can possibly be a bigger advantage. Something that can be grabbed and put into immediate action is going to be an even bigger advantage. And something even better yet, is something that will put a very heavy payload into the Threat Target with a single, Joe Biden Approved, blast. I have a number of Shotguns and the Shockwaves and the TAC-14’s have become personal favorites… again, I lean heavily to the Shockwaves. I’ve yet to have one of them give me even the slightest of problems. And I’ve yet to have one hit me in the face like you see people do in funny Youtube Videos. Technique is important. Respecting the Gun is also important. To aim a Shockwave, you need to use both hands and you need to push forward with your Off-Hand. The Hand Strap is there for a reason, and you need to leave it on there. All shotguns need to be aimed. And the Shockwave is no different. People tend to think that a shorter barrel means the gun is going to spread the shot pattern like a coin-op automotive pressure washer. This isn’t the case. In fact, with good load selection, the Shockwaves (and the Tac-14) can pattern extremely well. In close quarter situations, your shotgun group may be no larger than a silver dollar, or a tea cup’s saucer. With some loads, the spread may not be much larger than the bore diameter. So the Mossberg Shockwave absolutely needs to be aimed. This is going to require practice, and you are going to need to get used to the way this gun recoils. Once you get used to the way these things feel, you can quickly find that the gun is pretty easy to use. Like any shotgun, before you load it up with a defensive load and the gun is put into Cruiser Ready to wait until it’s needed, you need to pattern it. Patterning a Shotgun is like Zeroing a rifle. It’s critical that you do this. And it’s something that you need to take the time to do it right. For most people, the Shockwave gets discounted due to Low Expectations. They don’t take it seriously as they do their AR’s or their more expensive, full-sized Shotguns. They toss in Aquilla Mini-Shells and then they claim the Shockwave doesn’t group. Mini-Shells rarely pattern well in any gun. Or they grab a bulk pack of #7 Shot and then act goofy with the gun and only do mag dumps at cardboard. I mean, yeah, that’s fun… but that’s no indication as to how the gun actually performs. Like patterning your M1 Super 90 or SLP… You need to get a lot of different defensive loads of the persuasions that you deem best. You need to spend some time on Pattern Boards and find the load that works best for Your Gun. There is no blanket “This load is best for Shockwaves” shells out there. It doesn’t work like that. Once you do find the best load for your shotgun – buy lots of THAT ammo. And then get used to THAT load in your gun. The way it feels, the way it hits, and you need to practice with this. Guns like a Shockwave – or any Defensive Firearm – are guns that are your Final Option. So you DAMN WELL BETTER be very familiar with these guns. How they work, how they feel, how to operate them. Quite literally, you need to be able to rock these without looking at them or without having to sort them out in your hour of most dire need. A Shockwave wont let you down… But you can very easily let the Shockwave down by not taking it seriously. I’ve been thinking about getting a 20-gauge and SBR-ing it. (buggered shoulder don’t like 12-gauge). Any idea if it’d be possible to mount a MagPul SGA stock to a 20-gauge? Yup. The 20 gauge should work just fine with an SGA stock – which IS the best thing you can do to a Mossy. I agree with you on this one, George. Gabe Suarez has done a fair amount of work with these, inc. a side-folding stock option that keeps it very short, and magnifies effectiveness. Here’s an idea – what would you think of a short duck-bill choke on it? Spread the pattern sideways, or turn it 90° and pepper em from skull to pelvis? Waddaya think? I’m hesitant to make a specialized weapon even more specialized. Flexibility is a Shotgun’s Strong Suite, and even though the Shockwaves are short – they are still pretty useful for a lot of different applications. Duck Bills reduce that. Sure it might optimize it for certain specific applications… but… I like more options. I shot an IDPA match recently that had a Shockwave as a pickup gun for a stage. (Probably not the best choice.) It was also pouring rain and we were standing in mud. I picked up the gun for the first time when they let us dry fire it before we shot. I wanted it nowhere near my face, especially as the gun was wet! I fired the three required rounds from the hip and moved on to finish with my pistol. I wasn’t intrigued at time. In a twist of fate, I happened to also win the random drawing for a new Shockwave. Since I brought it home I’ve dry fired it, a lot, and feel comfortable. I hope to be able to get it on the range soon. I totally see the utility of the gun and plan to make it my bed room gun. Wow, that’s a nice prize. Excellent review. Your commentary and points about what you do and why you do it are spot on. Most shotgun novices could learn more from this short piece than from a book or video by most other folks. Other than Massad Ayoob, I think you are the best I’ve ever run across at getting to the really important stuff without a lot of excess verbiage. 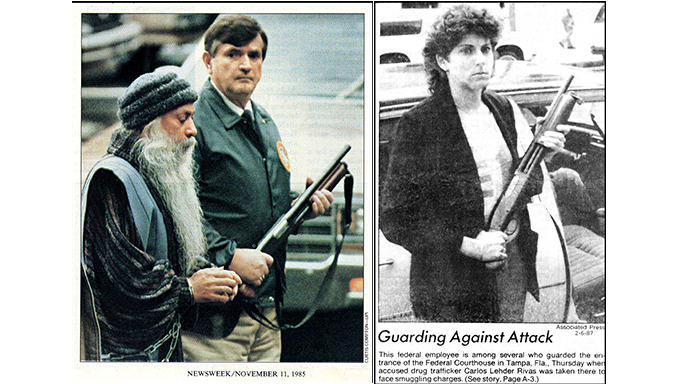 Both of you provoke thought-which is a really good thing when discussing firearms. Two thumbs up, sir. I like Tac-14 more. But you need to get used to the pistol grip only shotguns. Anyway, great range toy! Good article. The Shockwave is like a lever gun or pump shotgun in the AR world: most people are not going to put the extent of work in that’s necessary to really appreciate what it is. Ive worked with mine quite a bit, and am impressed at what such a compact shotgun brings to the table. Mine is the closest gun to me when I’m in my Office. It’s going to stay there. It’s impressed the hell out of me, more than I thought it would. I love this gun. Its like owning a blunderbuss. I also admire Mossberg for forging a trail in this interesting area of firearms catagories (versus ‘follower’ Remington).